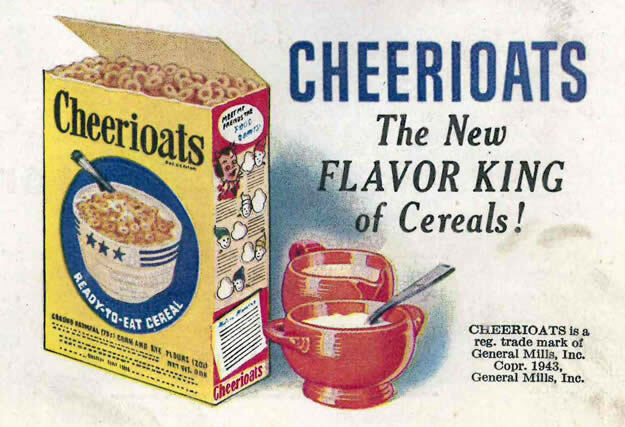 General Mills’ Cheerioats was invented in 1941. 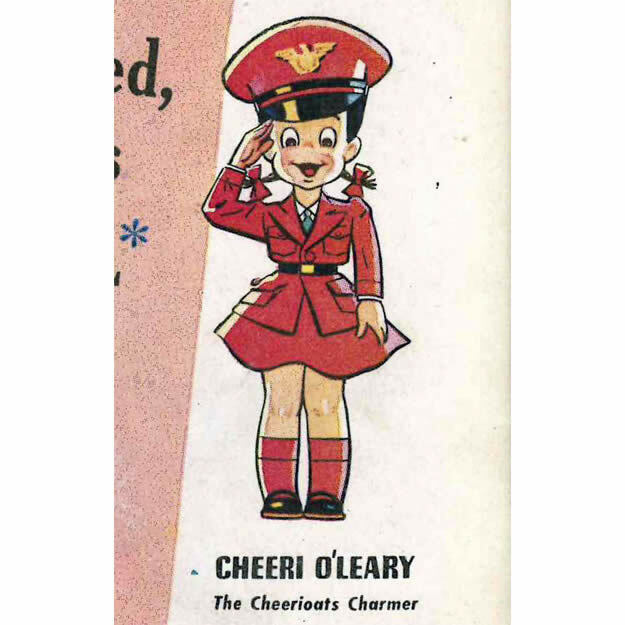 It didn’t long for Quaker Oats to gripe about the name and threaten legal action, so Cheerioats became Cheerios in 1945. Good thing, because autocorrect hates hates hates “Cheerioats”. More knowledge for ya: In the wonderful world of geometry, the Cheerios shape is called a torus, “a surface of revolution generated by revolving a circle in three-dimensional space about an axis coplanar with the circle.” The more you know. And apparently, our ancestors used to pour cream instead of milk on their breakfast cereal. I might just have to try that. Along with the original product name, this ad made me snoop around on another couple of things. Darn you, curiosity! Who the hell is Cheeri O’Leary? Cheeri is a true original, at least when it comes to mascots. She was soon replaced by a schmuck named Joe Idea, who was later replaced by The Cheerios Kid. What the hell is Vitamin G? Way back in time, early man referred to C17H20N4O6 as vitamin G. To make things even more confusing, vitamin G was actually vitamin B2. Smarter minds eventually prevailed and simply called the stuff Riboflavin. Mmmm…. Riboflavin. Hail to the Flavor King, baby. 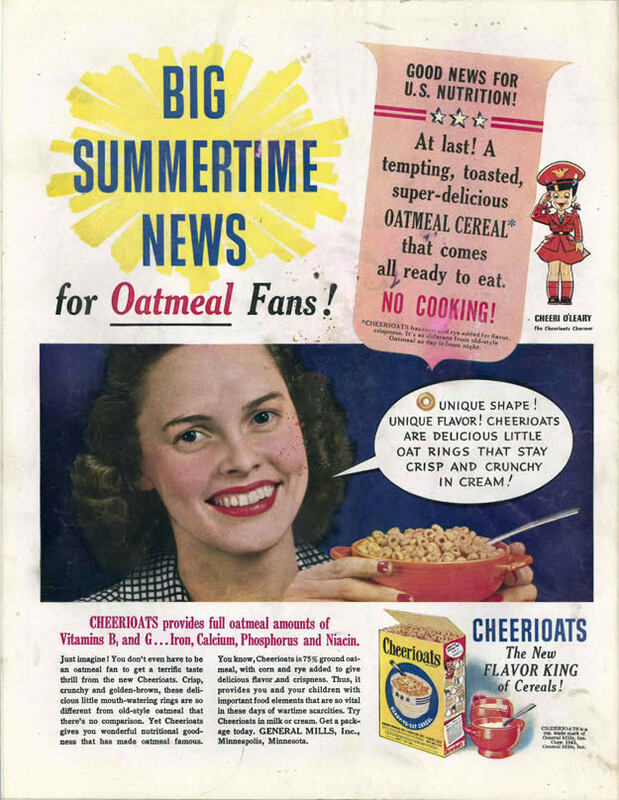 Big Summertime News for Oatmeal Fans! Good News for U.S. Nutrition! At last! A tempting, toasted, super-delicious OATMEAL CEREAL* that comes ready to eat. No cooking! * CHEERIOATS has corn and rye added for flavor, crispness. It’s as different from old-style Oatmeal as day is from night. O Unique shape! Unique flavor! Cheerioats are delicious little oat rings that stay crisp and crunchy in cream! CHEERIOATS provides full oatmeal amounts of Vitamins B1 and G…Iron, Calcium, Phosphorus and Niacin. Just imagine! You don’t even have to be an oatmeal fan to get a terrific taste thrill from the new Cheerioats. Crisp, crunchy and golden-brown, these delicious little mouth-watering rings are so different from old-style oatmeal that there’s no comparison. Yet Cheerioats gives you wonderful nutritional goodness that has made oatmeal famous. You know, Cheerioats is 75% ground oatmeal, with corn and rye added to give delicious flavor and crispness. Thus, it provides you and your children with important food elements that are so vital in these days of wartime scarcities. Try Cheerioats in milk or cream. Get a package today. General Mills, Inc., Minneapolis, Minnesota. The New FLAVOR KING of Cereals! Cheerioats is a reg. trade mark of General Mills, Inc., Copr. 1943. General Mills, Inc.